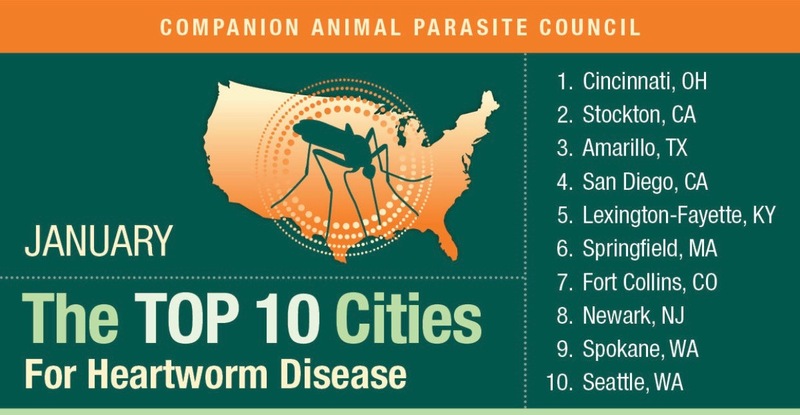 The Companion Animal Parasite Council has released a list of ten cities with the greatest increase in heartworm disease. Cincinnati was number one, followed by Stockton, CA and Amarillo, TX. As our weather patterns change and the disease becomes more prevelant, it is now more important than even to keep our pets on year round preventatives. We have several options here at Mason Animal Hospital. Monthly oral and topical products are very easy to use. We also carry an injectable form of prevention that lasts for six months called ProHeart. For more information regarding the report from CAPC, follow the link here.